Structure versus chaos – I love to use this contrast on many of my scrapbooking layouts. On today’s scrapbooking page, I am showing a well-structured foreground versus a chaotic, mixed media background I created with Amplify. After gently removing the stencil, partially heat the stars to give some more dimension than others and let everything dry completely for 1 hour minimum. I arranged my photos and pieces of paper in a rectangular order right in the center of my background. To finish the arrangement off, I added some stamping. Here’s a quick and easy scrapbook layout to try. With the kids at home, there does not remain much time for crafting. I know the kids may not look forward to going back to school- but sometimes moms do! I took my Radiant Neon Amplify! and just splattered it – the consistency is perfect for this technique! I put a bit of Amplify on my craft mat and took it up with my palette knife. I then created several splatters in moving my arm down quickly. I partly heat embossed the splatters to make the color pop-up at the borders. To create some more interest on the background, I used a cling-mounted “star” rubber stamp and black Memento ink. Add layers of torn paper, embellishments, photo and sentiments to complete your page. I chose one of my beautiful BoBunny papers as a base for my layout and added multiple stripes of Tear It tape. The tape is double-sided adhesive and easy to hand tear, which makes it very comfortable to use. After removing the backing, I sprinkled sequins in blue, yellow and white all over the tape. The Tear It tape provides a strong adhesion, which keeps all the sequins firmly in place. To cover the sticky areas between the sequins, I also added some white glitter. After adding various layers of more BoBunny papers, my photo, and embellishments to my bag and adhering to my scrapbook page, I finished it off with stamping a few highlights using Memento Tuxedo Black. Mass producing cards is always a challenge. On the one hand you want the cards to look valuable, on the other they need to be done in an acceptable amount of time. Using the Kaleidacolor multi-color inkpads saves a lot of time and makes your cards a true eye-catcher. Emboss white cardstock with a embossing folder using your die cut machine. Repeat for number of cards you are making. Die cut your frame shape into each embossed cardstock piece. Sew around the cardstock borders with black thread. 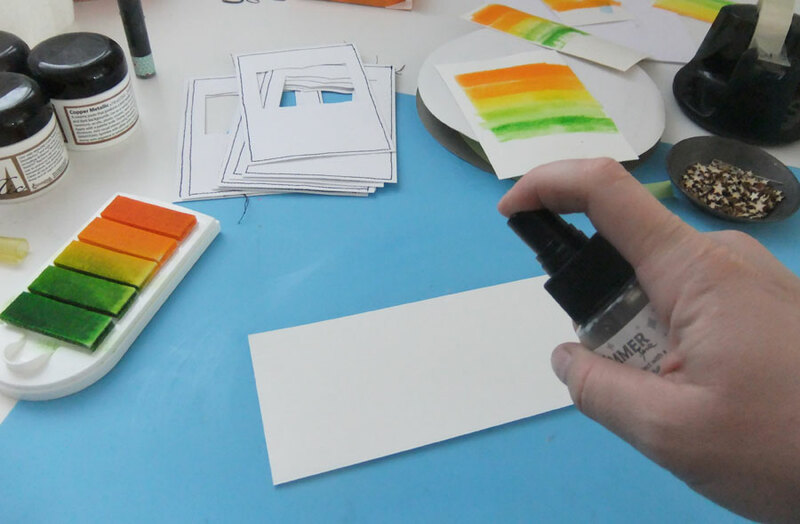 Gather enough watercolor paper scraps to fill the frames of each card and spray them with Sheer Shimmer Spritz. Press the Kaleidacolor inkpad, with colors slid together, directly onto the wet watercolor paper and wipe it over the paper, pressing slightly. 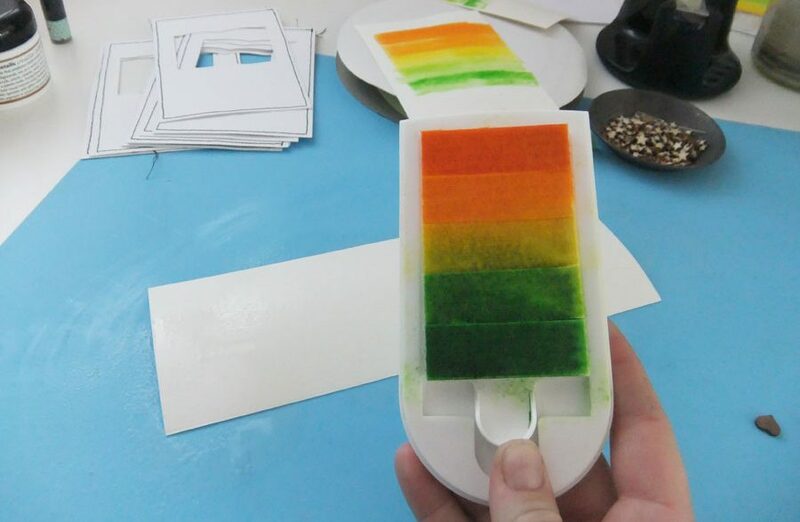 Use a wet brush to blend the colors. 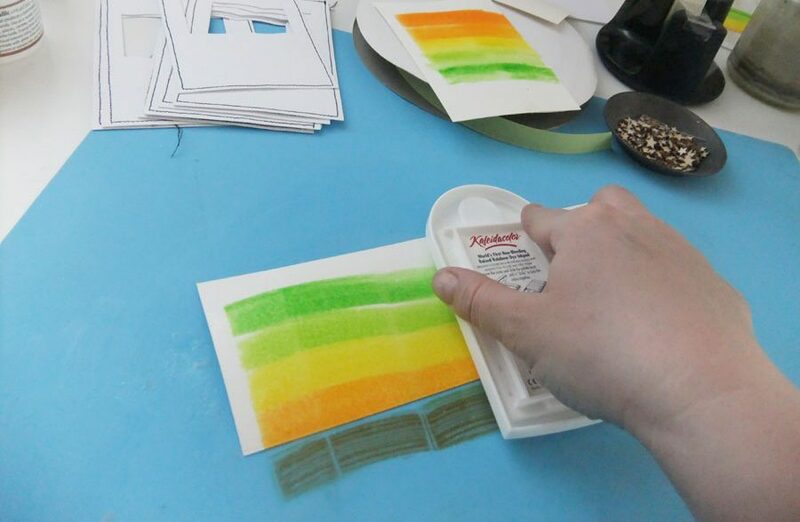 Adhere the watercolor paper to the BACK of your embossed cardstock, so the color shows on the front. Hand-write or stamp the title of your cards on the watercolored background. In my case, I was working on a commission for gift cards (Gutschein is the German word for gift card). To add some highlights to the embossed background, sprinkle over it with the black Fireworks! spray. I chose the simple kind of bow-making for these cards. 🙂 Adhere a piece of ribbon to the front of the white cardstock using Tear-it! Tape on the edges back. Then tie a neat knot at the front, using another piece of the same ribbon. It will give the appearance of being one piece wrapped around. The final step is to adhere the finished front to the black card base. I used foam tape to add additional dimension and embellished with a couple of small hearts and stars. The bright Bo Bunny papers from their Toy Box collection inspired me to create a multi-layered mixed-media background which matched the colors of the papers. A perfect way to celebrate Father’s Day this weekend! 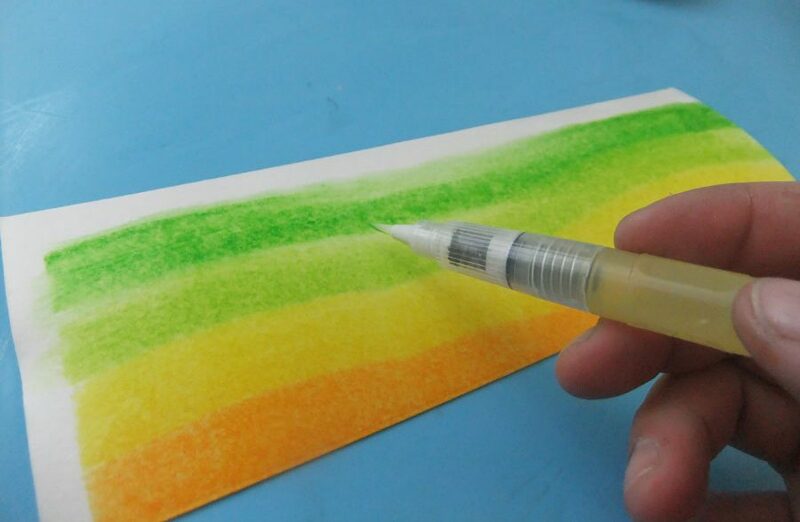 Here is a fun technique to bring splashes of color to paper. Simply spray Fireworks! onto a piece of clear foil a few times. Lightly press the piece of foil onto your cardstock. You can either press down the complete piece, or only parts of it. The effect gets even prettier if you use various colors. Simply remove colors from the foil with a damp cloth before applying a new one. After the foiled Fireworks! is dry, apply the next element using Creative Medium and a stencil. Apply a little bit of the creamy paste here and there, not all over the background. For the final addition to the background, randomly stamp the lovely ampersand with VersaFine in Blue Lagoon. Now it is time to get those pretty BoBunny papers, embellishments and stickers on the background. And of course the photo of Dad! I love to add large titles on my pages in different sizes and fonts. I handcut the large “10” from paper and typed “for being the best” on my old typewriter. Below the “father”, there is still some room for me to fill in some journaling. I added a bit of paper on top of a Handcut Monterey Pine star. A true eye-catcher! Letting my friends know how much I appreciate them is my main reason for cardmaking. Giving a card to someone, which took you quite some time to create, is a valuable gift. Especially nowadays, when hectic schedules and stress are our daily companions. I created a simple background on white cardstock, using a dauber and my Radiant Neon 4 Warm inkpad. The dauber creates the perfect circles and you can vary the opacity by pressing it down harder. I tried to achieve some kind of Bokeh effect by overlapping some of the circles. Using my StazOn Jet Black inkpad, I stamped some small feathers onto the spaces between the circles. I cut a large feather from white vellum, which was meant to compliment the background, but not completely hide it. To add some color to the feather, I masked the bottom with adhesive tape and generously applied silver metallic Creative Medium. I carefully removed the adhesive tape and let the color dry completely (about 15 minutes). Adhere your stamped piece to a coordinating cardstock frame and adhere both to your card base. I used a couple of different pieces to create my sentiment and embellished with a yellow rose. This could also be a fun card for a graduate to give her BFF!